Beds at the migrant tent camp facility in Tornillo, Texas. Photo credit: Department of Health and Human Services. Courtesy of Borderzine. Costs of detaining migrant children at shelters in Tornillo, Texas, and other locations around the country are skyrocketing, with the Trump administration now saying it may cost $100 million a month just to operate the 3,800-bed tent facility outside of El Paso. The administration has not yet provided an accounting of how much in total it has been spending to detain children who either were separated from their parents or apprehended after crossing the border without a parent or guardian. But information so far indicates the amount is substantial, forcing the government to transfer hundreds of millions of dollars targeted for medical research, treatment, and other programs so that it can care for a rapidly growing number of children in government custody. I have been writing about these issues for Texas Monthly and the Washington Post since June, when the government opened what was then a 400-bed shelter in Tornillo. While the world’s attention was focused on the controversial family separation policy, less attention was paid to other important changes to policies on how migrant children were treated. A key issue has been how US officials treat what the government calls “unaccompanied alien children,” the thousands of children arriving each month at the border without a parent or guardian. The vast majority of such children come from Guatemala, Honduras, and El Salvador. Over the past five years, most of these children were held for a month or so in shelters operated by the Office of Refugee Resettlement (ORR) before being placed with a sponsor—usually a parent or other family member—while their immigration cases were considered by the courts. But the Trump administration has adopted new requirements for sponsor families. The biggest change is a new requirement this year that anyone wanting to sponsor an unaccompanied child must submit their fingerprints—and the fingerprints of any adult in the household—to Immigration and Customs Enforcement. ICE has estimated that about 80 percent of sponsor households have at least one undocumented adult. In a June 23rd article I wrote for Texas Monthly, people who work with migrant families warned that the fingerprint requirement and other new policies would make sponsor placements increasingly difficult. These changes “undermine family reunification, the fundamental principle of child welfare law, by turning safe placement screening into a mechanism for immigration enforcement,” the Women’s Refugee Commission and National Immigrant Justice Center said in a statement. That warning has proved prescient. The number of unaccompanied children in ORR custody has swelled from about 10,700 in May to more than 13,300 in September, the highest number ever recorded. At the outset of the Trump administration, fewer than 5,000 children were in the custody of ORR, an agency of the Department of Health and Human Services (HHS). The growth has occurred even though the US has not been seeing a huge spike in unaccompanied children arriving at the border, as occurred in 2014 and 2016. “The numbers of arriving children are higher than they were last year, but lower than they were in either 2014 or 2016. This is not about having a historically high number of arriving children, but it is about a historically high number of children in shelters,” said Mark Greenberg, who during the Obama administration oversaw programs for unaccompanied migrant children. HHS has said the average time a child spends in ORR custody before being placed with a sponsor has gone from 34 days in 2015 to 59 days as of August. Those numbers don’t include children who remain in ORR custody without a sponsorship placement. “Looking at the increased length of stay over this past year, it looks like it is some combination of more restrictive policies and overall immigration enforcement climate that makes parents and other household members afraid to come forward, and probably some disruptive effects from family separation,” said Greenberg, now a senior fellow with the Migration Policy Institute. He said the number of children in ORR custody is growing at a rate of about 1,000 a month. 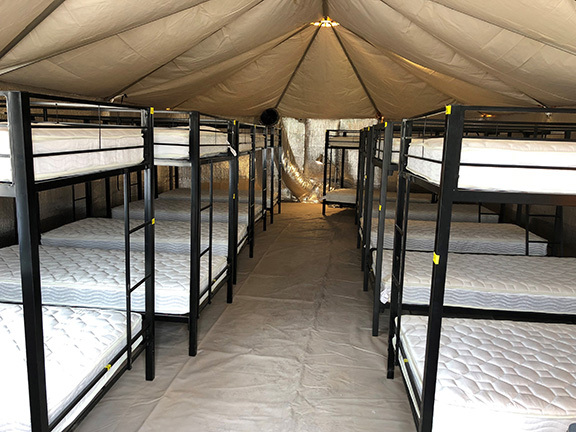 ORR doesn’t have enough beds in its permanent shelter facilities across the country to handle the growing caseload, so in June it opened the tent facility at the Marcelino Serna Port of Entry in Tornillo. (Marcelino Serna was an undocumented immigrant from Mexico who became the most decorated Texas soldier of World War I.) ORR also has another temporary facility in Homestead, Florida, that can house 1,400 children. The Tornillo facility drew numerous protests in June and July because it opened during the administration’s family separation policy, but only a small percentage of children housed there had been separated from their parents at the border. The vast majority had been apprehended after crossing the border without a parent or guardian. The Trump administration quietly expanded Tornillo’s capacity twice in August, first to 500 beds and then to 1,200. Earlier this month, HHS announced that Tornillo would be expanded to 3,800 beds and remain open at least through the end of the year. Even before the expansion, the cost of housing unaccompanied children had soared. As Amy Goldstein and I reported in a story on Friday for the Washington Post, the Trump administration transferred $446 million from various federal health and human service programs to pay for the added costs of caring for the children. That is on top of the $1.2 billion the administration had budgeted for the program in Fiscal Year 2018, which ends September 30th. I got a list of the money transfers from Rep. Rosa DeLauro of Connecticut, who is the ranking Democrat on the House Appropriations subcommittee that oversees the unaccompanied children programs. The transfers were approved by HHS Secretary Alex Azar. They include $16.7 million taken from Head Start, $13.3 million from the National Cancer Institute, $12.1 million from the National Institute of Allergy and Infectious Diseases, and $6.3 million from substance abuse treatment programs. The costs of the unaccompanied children program likely will continue to soar. On Tuesday, HHS issued a notice in the Federal Register that it will pay up to $367.9 million between September 14th and December 31st to BCFS Health and Human Services, the San Antonio-based nonprofit that operates the Tornillo facility. That notice confirmed my September 11th story for Texas Monthly that it would cost $100 million a month to operate Tornillo when it was at capacity. BCF officials have said it costs $775 a day to house a child in a temporary shelter, compared to $256 a day in a permanent facility. Placing a child with a parent or other sponsor lowers the government’s cost to near zero. The cost of operating the Tornillo facility—one of many ORR programs for unaccompanied children—could consume a quarter of the $1.2 billion budget for caring for unaccompanied children in the first three months of Fiscal Year 2019, which begins October 1st. This story was produced by Borderzine, a nonprofit news organization covering life on the US-Mexico border and Latino issues. It was published in its original form here.